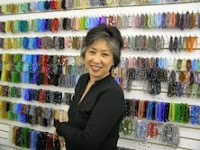 Meet Lilian Chen: A Remarkable Designer with a Remarkable Story! 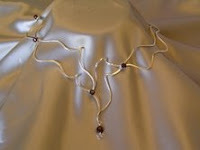 Lilian has developed a special wire technique that fastens pieces together without soldering or showing a wire’s beginning or end. 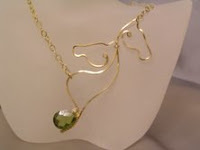 The result is jewelry that has almost a magical flow! Lilian was born and grew up in Shanghai, China, but came to the U.S. with her husband in 1983. Although her work looks as though she’s been doing it for years, she actually started beading five years ago, creating her extraordinary style just two years ago…and she is completely self-taught, which may be one reason her designs are so unique! Who taught you the techniques you use? Actually I didn’t take any class, I learned by reading lots of the beading books and magazines or go online to see the jewelry people made and window shopping every where when I travel. I never miss any chance to see any kind of jewelry. Then I try to figure out how, practice over and over to understand pattern, So lots of techniques I use, I created by myself during the practicing. How would you describe what makes your jewelry unique? Simple, natural, with artistic connection, and the 3-D style gives my project more artistry. 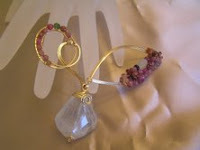 Good combinations with color, chain and with beads also are my speciality. What advice do you have for other jewelry designers? Every one has something special inside already. Never give up, keep moving on, more practice gives you more ideas. Learn from other people but don’t follow what they do. You want to be a leader so you have to be different from others. What do you do when you are struggling with creativity? Everybody has a different way to release. For me, I play Sudoku to freshen my mind. With Sudoku my mind focuses to solve the problem. Believe it or not, I always get new ideas after I play Sudoku! What are your goals with your jewelry? Keep learning new technique and created new designs and really enjoying what I’m doing. Lilian’s work has been published in both Bead & Button and Art Jewelry and she can be contacted via email at: lilian888crystals@yahoo.com. It is my pleasure to share Lilian with you!